PRINCE ALBERT, SASK. — When curling teams look at an upcoming draw, it’s tempting to try and find the ‘free space’; the game on the board that could an easy win. 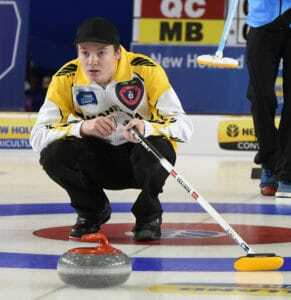 Newfoundland and Labrador’s Greg Blyde arrived at the Art Hauser Centre in Prince Albert, Sask., determined to show the competition that his team wouldn’t be the free pass some of the opposition might think they were at the 2019 New Holland Canadian Junior Curling Championships. Blyde and his team from the RE/MAX Centre, St. John’s Curling Club picked up a convincing 9-5 victory against Manitoba’s JT Ryan from the Assiniboine Memorial Curling Club in Winnipeg. Newfoundland and Labrador opened the game with five consecutive steals for a 7-0 lead over the first half of the game. Blyde, who skips but throws third stones, joined his teammates fourth Daniel Bruce, second Ryan McNeil Lamswood and lead Nathan King after last season. Blyde lost to that team at last year’s provincial junior final, led by Bruce, which finished 4-6 at the 2018 event in the Championship Pool. Blyde led a different team at the 2017 nationals, finishing 6-4 in the Seeding Pool. The move has paid off as Newfoundland and Labrador have put together three wins in a row and are very much alive in the playoff picture with a 5-3 record. The team is right behind Manitoba in the standings, now at 6-3 after the loss on Thursday afternoon. 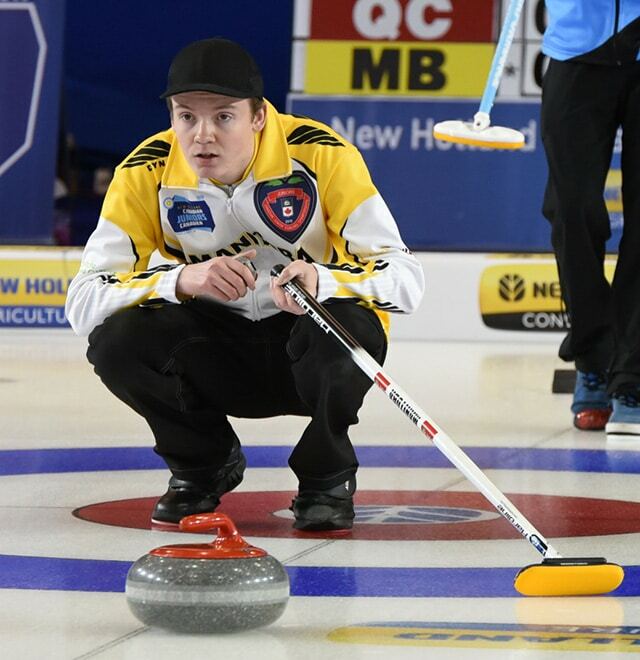 A Newfoundland and Labrador men’s team has never finished with a winning record in the Championship Pool at the New Holland Canadian Juniors, which is something Blyde wants to change this year. 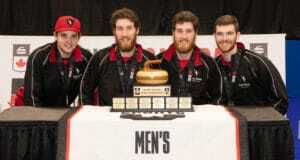 The last time a team from Newfoundland and Labrador has won the national junior men’s title? You have to go back to 2001 when Brad Gushue claimed it, along with the world championship. Gushue is the reason Blyde started curling. He was first hooked on the sport while watching Gushue claim the 2005 Canadian curling trials and 2006 Olympics. 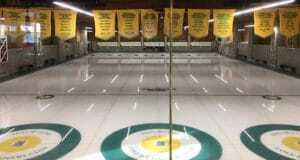 In other Championship Pool action, Saskatchewan’s Rylan Kleiter from the Sutherland Curling Club in Saskatoon won his fifth straight game with a 12-2 victory against Greame Weagle’s team from the Chester Curling Club in Nova Scotia. Scores of four in the first and fifth ends elevated Saskatchewan’s record to 8-1, while Nova Scotia dropped its second game of the day and sits at 4-5. 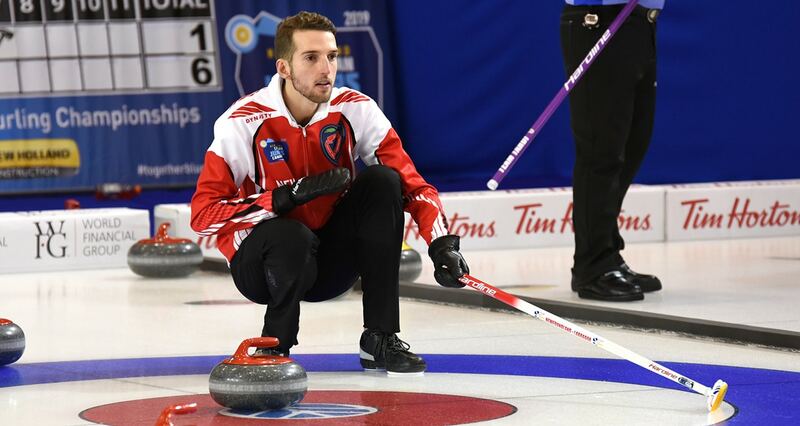 British Columbia’s Tyler Tardi (Langley and Victoria Curling Clubs) maintained pace with Saskatchewan with an 8-1 record after defeating Quebec’s Vincent Roberge of Club de Curling Etchemin (4-4) 6-4. 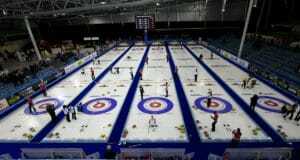 In the men’s Seeding Pool, Prince Edward Island’s Tyler Smith (Charlottetown Curling Complex) ousted Nunavut’s Javen Komaksiutiksak (Iqaluit Curling Club) 16-2. P.E.I. is now 3-5, while Nunavut is 0-8. Alberta’s Selena Sturmay (Saville Community Sports Centre, Edmonton) remained flawless at 8-0 after a 6-3 victory against Manitoba’s Mackenzie Zacharias of the Elmwood Curling Club in Winnipeg, who now sits at 5-3. Kaitlyn Jones from the Halifax Curling Club in Nova Scotia raised its record to 5-3 after an 8-4 win against Justine Comeau’s Capital Winter Club (Fredericton) team. Comeau is now even with a 4-4 record. British Colmbia’s Sarah Daniels (Delta Thistle Curling Club, North Deta) has sole possession of second place in the Championship Pool at 7-2 after a 9-7 victory against Saskatchewan’s Sara England (Callie Curling Club, Regina) who is now 5-3. In the women’s Seeding Pool the Host Team, Skylar Ackerman from the Moose Jaw Ford Curling Centre improved to 2-6 after defeating Prince Edward Island’s Lauren Ferguson from the Cornwall Curling Club 8-4. Ferguson’s team is now 1-7. The Newfoundland and Labrador women’s team – skipped by Mackenzie Glynn from the RE/MAX Centre, St. John’s Curling Club – is at the top of the Seeding Pool (5-4) after defeating Ontario’s Thea Coburn (Dundas Valley Golf & Curling Club) 7-4. Ontario is now 4-4. Action continues at the 2019 New Holland Canadian Juniors with one more draw on Thursday at 7 p.m. (Central).